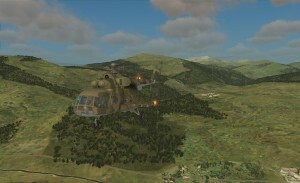 Acclimation is a single-player mission that comes with the DCS World module DCS: Mi-8MTV2 by Belsimtek. 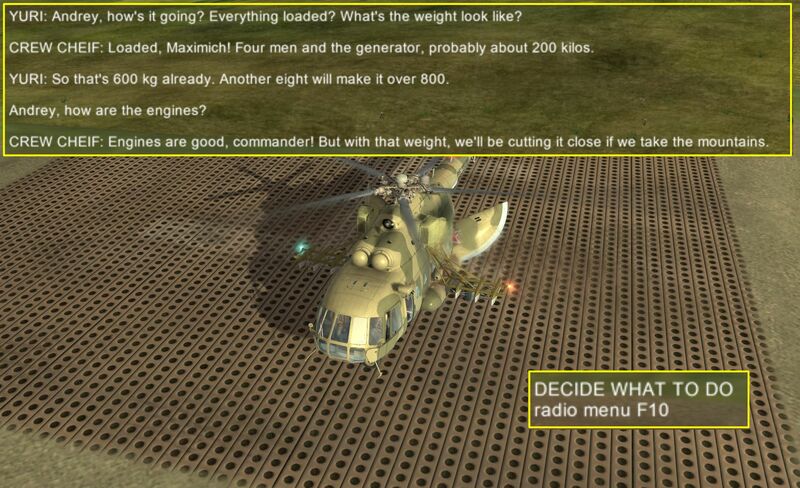 It’s playable either singly, via the Missions menu of DCS World, or as the second mission in the Mi-8MTV2 Spring Tension campaign. 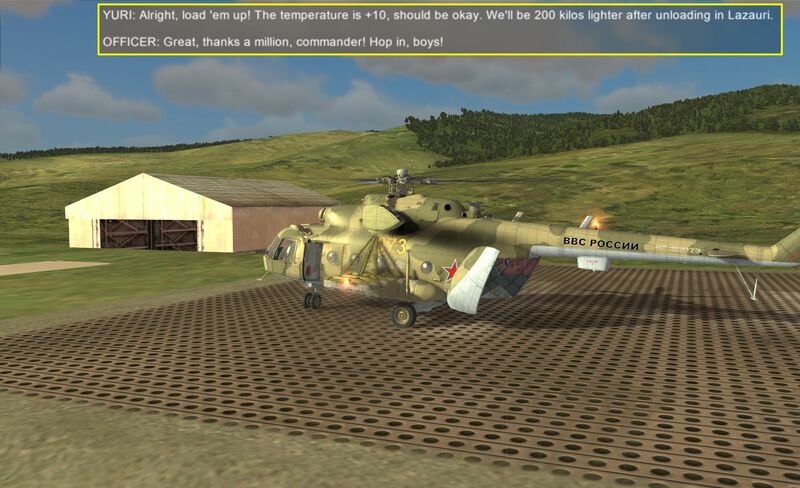 In this AAR, I use the Mi-8MTV’s ДИСС-15 doppler navigator to get from point to point. 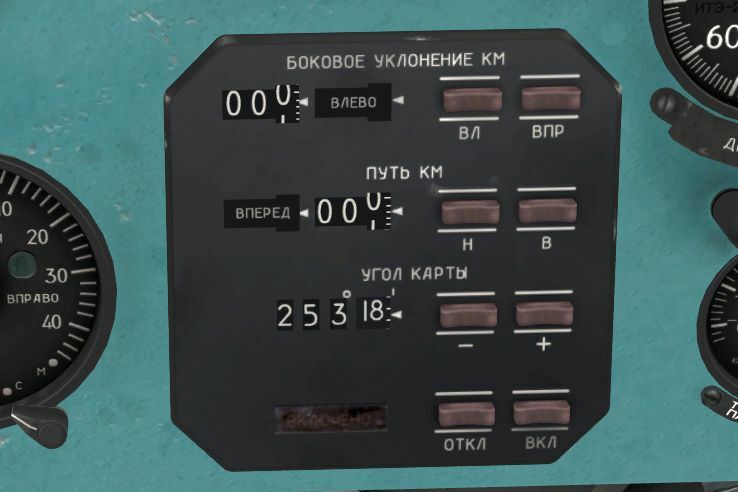 Although use of the ДИСС-15 is not at all necessary to be able complete this mission, I found this easy-to-use tool not only helpful in finding my way around, but also quite immersive. 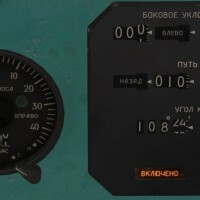 Without decent documentation, the ДИСС-15 can be difficult to figure out on your own, so I wrote a little tutorial on the ДИСС-15 doppler navigator to help with the basics. 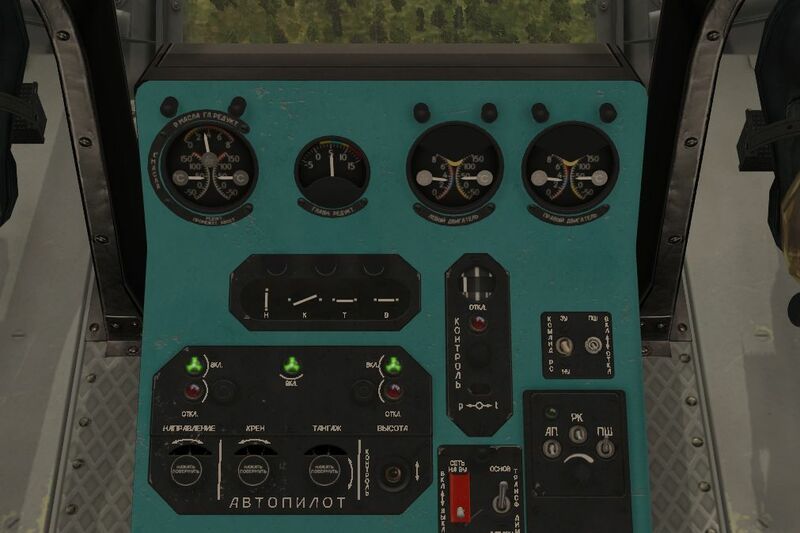 I recommend reading the tutorial, reading through this AAR, and then giving the ДИСС-15 a try of your own. 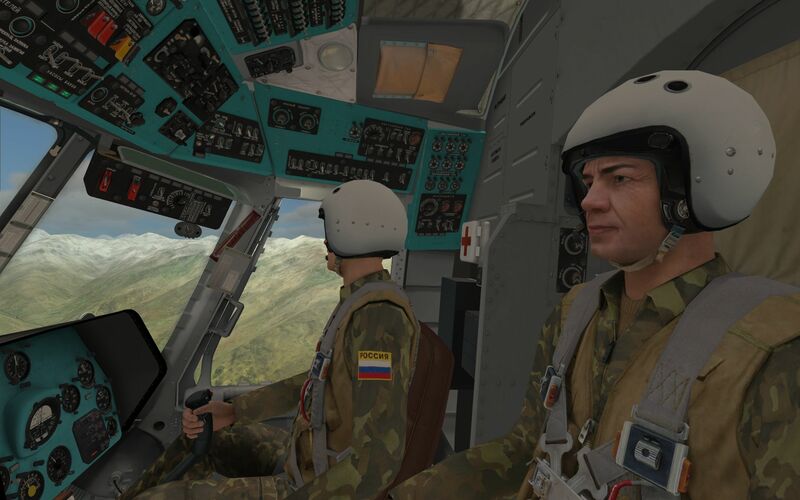 Acclimation puts me as Mission Commander of a Russian Mi-8MTV2 on a supply mission for troops stationed at an unprepared mountain location. The gear to pick up is located at Leningori, a town/village to the south-east of our current location at Java. 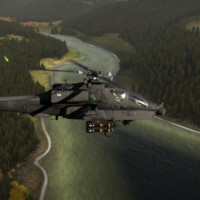 The mountain landing will be tricky because of the high altitude and heavy configuration, so I’ll need to be very careful with my approach and landing. 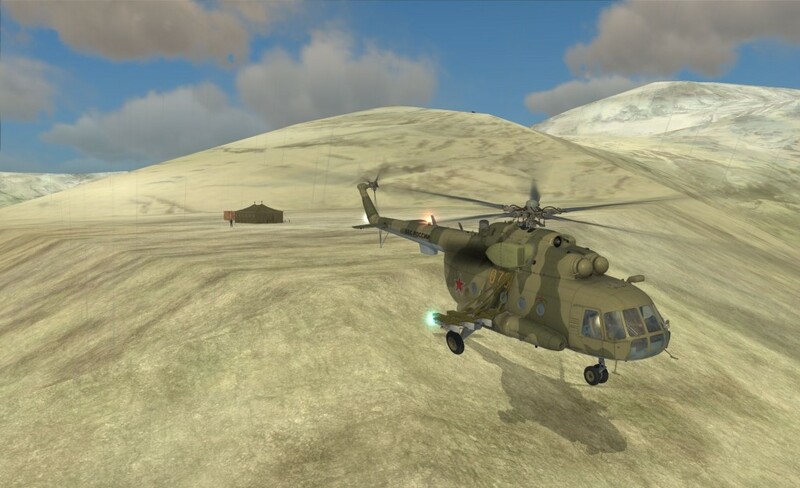 The Mi-8 is a resilient airframe, but not even the Russians make aircraft that can roll down the side of a mountain without damaging the soft cargo inside. 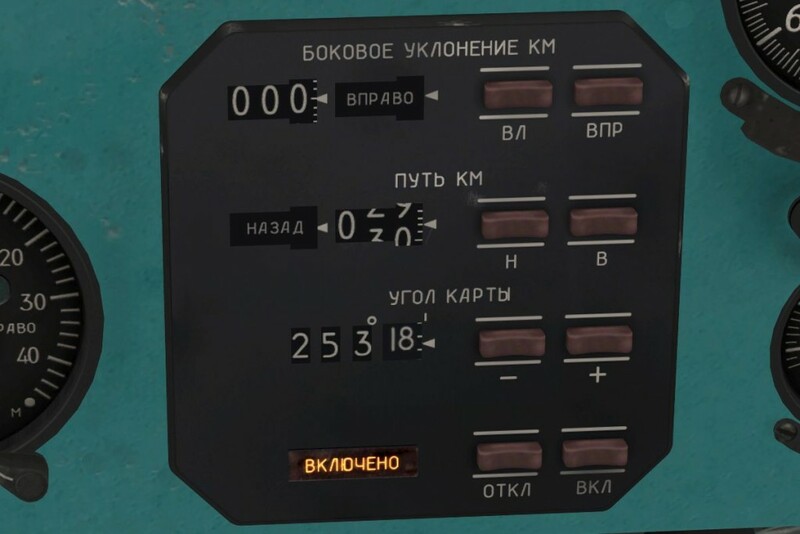 At the start of the mission, the navigator (copilot) reports we need to fly a heading of 112 degrees for 55 km to make our destination, but being a doubting Thomas (and trying to demonstrate the ДИСС-15 navigator), I bring up the F10 map to chart the route myself. Reading the chart for the first leg to Leningori. 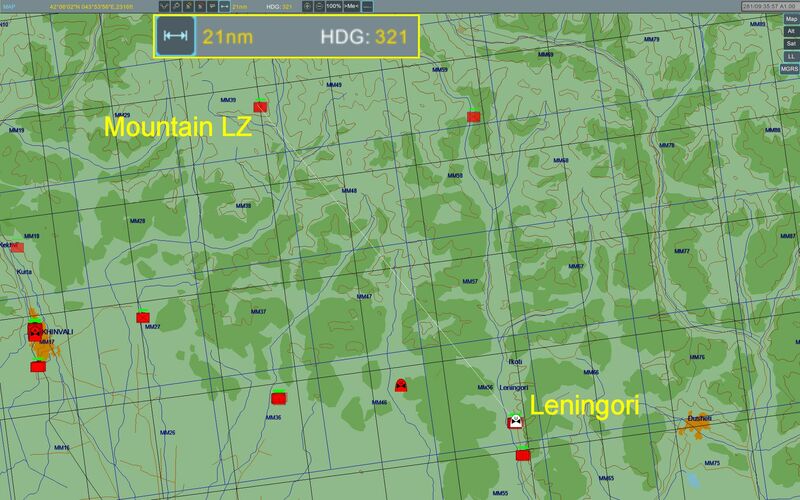 Using the nifty ruler function, I come up with a heading of 114 degrees and a distance of 32 nautical miles to the Leningori helipads. 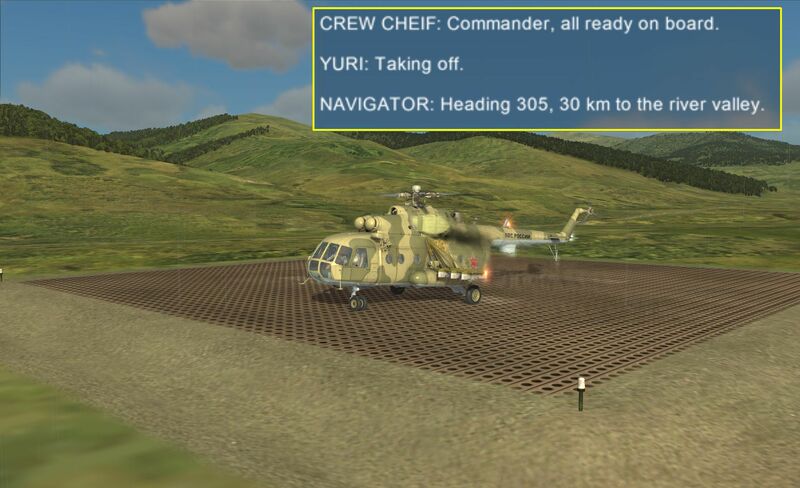 Either my navigator is drunk or I am, and since it’s my name on the schedule to crashfly this chopper, we crashfly by my numbers. 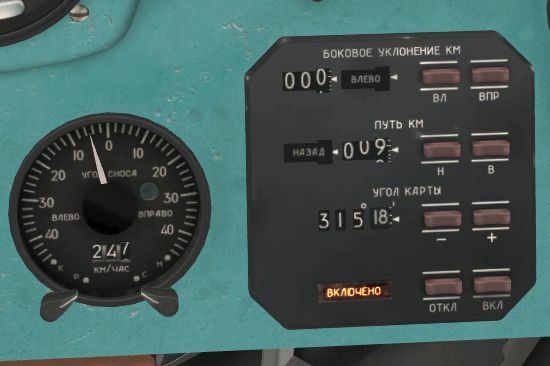 The ДИСС-15 doesn’t take nautical miles as input, so I have to convert that measurement to kilometers, multiplying by 1.852 to get 59.3 km (*shakes head at co-pilot*). I also need to convert the magnetic heading the F10 map ruler gave me to true by subtracting the local magnetic variation of 5.7 degrees to get 108.3 degrees true. I jot these results down on a pad of paper so I can pump them into the navigator once it’s powered up, and then I continue on with the start-up checklist. Before any aircraft start-up, I like to do a ramp check of the area, including a visual sweep to make sure I’m aware of any obstacles, traffic, or other factors that might affect my taxi or takeoff. Checking the area around your aircraft before start-up reduces paperwork by over 50%! 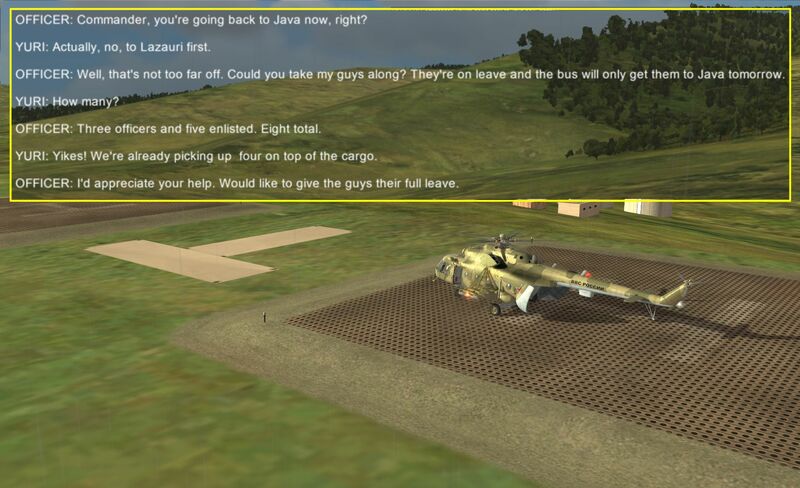 The FARP here at Java is pretty sparse and I’ve got plenty of room, but I notice something immediately – the weather. In my experience, only a few mission designers really take the time to include the environment in their mission design. The slightly overcast day and drizzling rain adds a certain ambiance to the experience that is refreshing after having played what feels like hundreds of hours of June 1, 12:00, cloudless, windless, day missions. Nice touch! 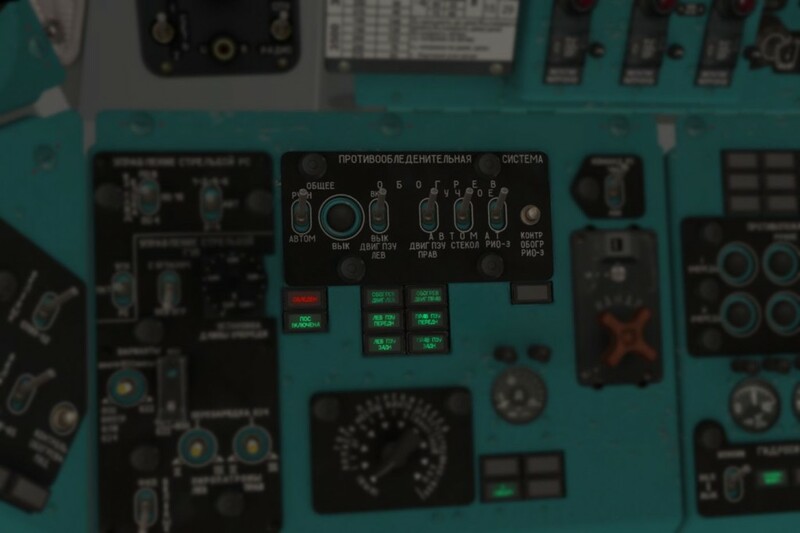 With the batteries up and external lights on, I continue the checklist through APU start and then engine start. Watching the bleed pressure rise as the APU start completes. At around 20% engine RPM, the EGT gauge takes off, showing fuel is being burned in the combustion chamber. 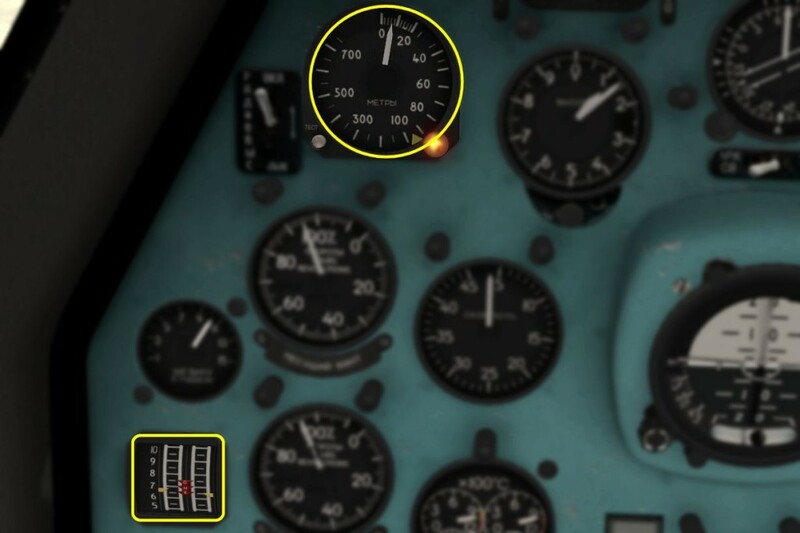 It’s all too easy to get complacent in a sim; checking oil pressures and temperatures is a good habit to get into. 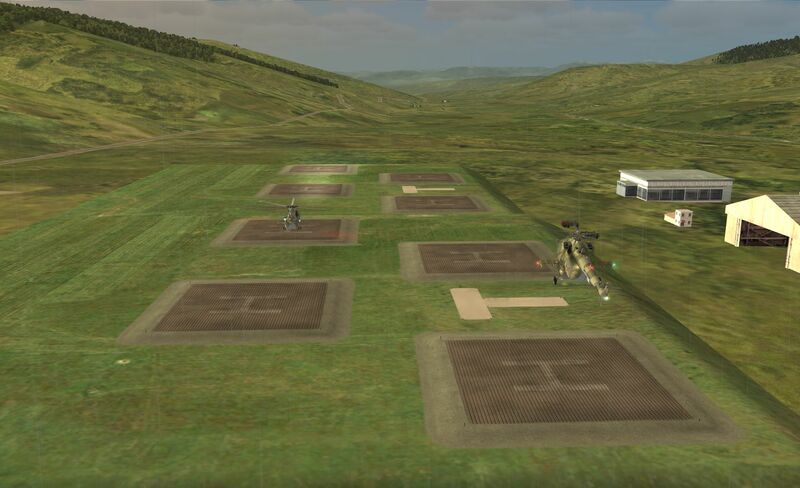 As I work through my start-up checklist, another nice touch flies in over my left shoulder – an AI helo touching down at the FARP ahead of me, followed a few minutes later by a second helo. 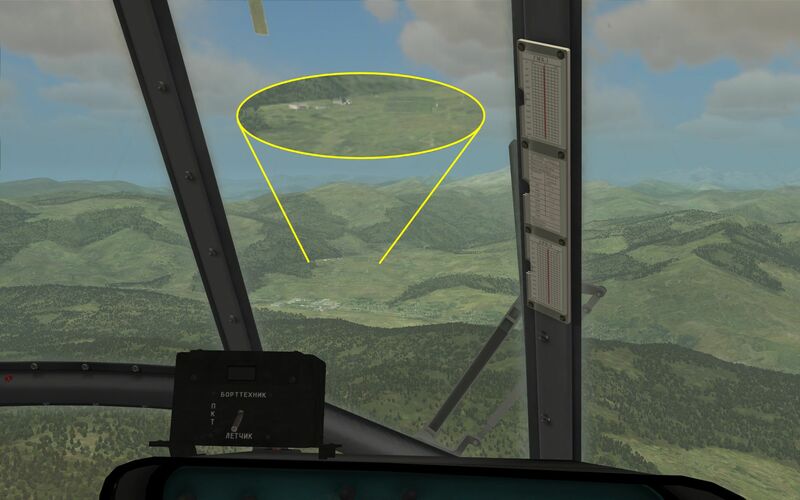 Although the AI in DCS World aren’t the sharpest bowling balls in the shed, they do add some life to an otherwise sterile background. 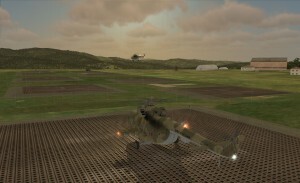 An AI helo lands at the FARP in front of me while I spool up. Another AI helo coming home just as I’m heading out. 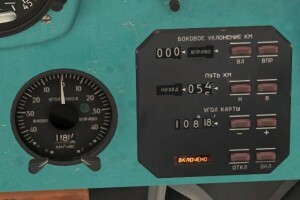 After the engines are up to running RPM and temperature, I start up the avionics, including the ДИСС-15. I need to check its mode and status and then program in the course I had plotted earlier. I also triple check that I’ve started the integrator before I switch to the pilot’s seat and start lifting up on the collective. Forgetting to enable the integrator before takeoff isn’t a lethal offense, but it sure is embarrassing. Liftoff is uneventful (the engine power meter shows plenty of margin during my hover check) and I accelerate towards my intended course of 108 degrees true as I gain some altitude. A double-check of the ДИСС-15 shows that it’s updating the position estimate as expected. So far, so good! 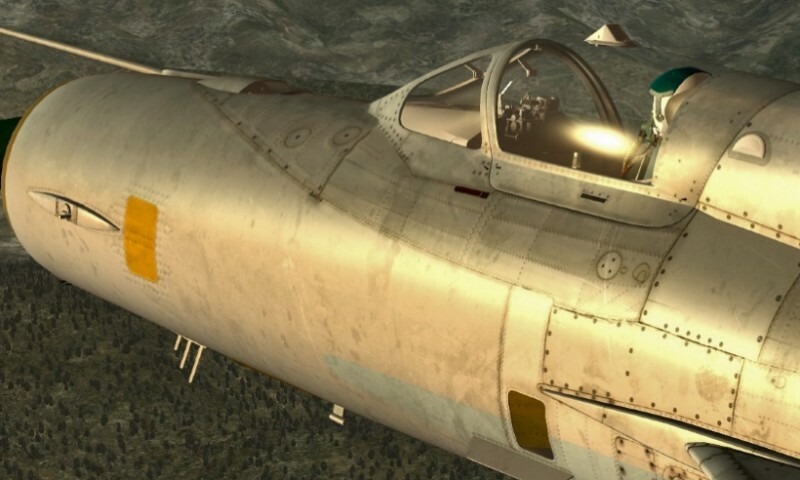 It’s a common mistake to firewall the collective on climbout – set a comfortable airspeed (150 km/hr) and let the engines work without flogging them. You might need them later. A quick climbout check: are the crosstrack values zero-ish and is the along-track value going the way you expect it to (up or down)? 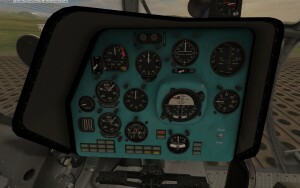 Once I get to an altitude that appears to put me over the top of the mountains ahead of me, I enable the altitude autopilot for some hands-off flying. 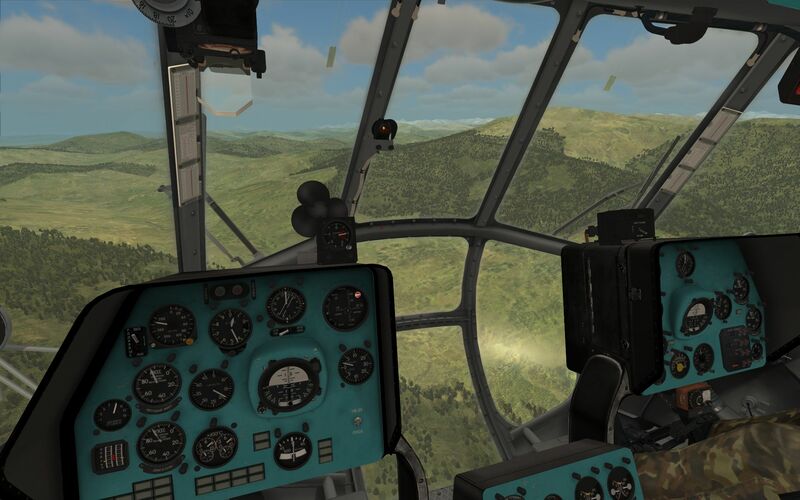 Autopilots, in general, are often and unfairly maligned, but even the Mi-8’s simple autopilot is pretty capable of keeping the flying boat level while I soak in the scenery. Say what you will about stale terrain, I love this view. Don’t fear the autopilot, but don’t give it your bank account PIN, either. Several straightforward minutes later, I find I’m within 15 km of my destination, which must be hidden from view by the ridge in front of me. Thinking about my descent plans, I make an early turn and start descending into a valley that looks like it will open up on my destination. As I round the ridge, I spot the Leningori landing pads and buildings and set up my textbook approach. 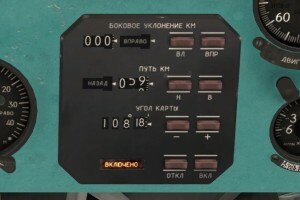 The TO method of the ДИСС-15 makes ETA’s pretty simple. Another flawless touchdown where I forgot to save the track yet AGAIN. The addition of buildings to the side of the FARP makes the installation a bit more believable. 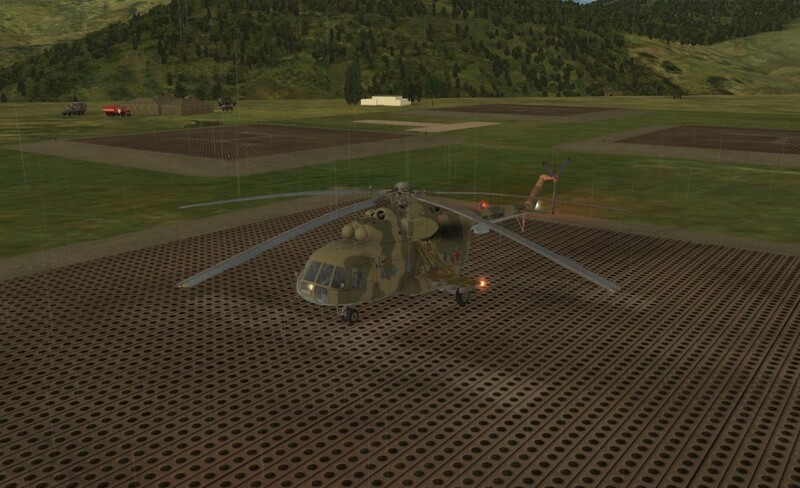 The Mi-26 that starts spooling up as I approach adds some more life to the scene, as well. 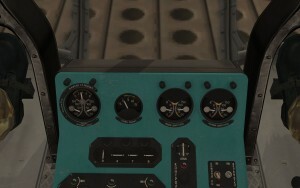 Once I land, the clamshell and blister doors open automatically, a neat effect that I immediately want to plagiarize (hint: makes use of X: COCKPIT PERFORM CLICKABLE ACTION in the Mission Editor Triggers). Unfortunately, I’m also approached by an officer who wants me to take some of his crew with me so they can enjoy their leave back at Java. Another high-five to the mission designer for incorporating F10 radio menu items to enable the player to interactively affect the story plot. Of course I say yes. 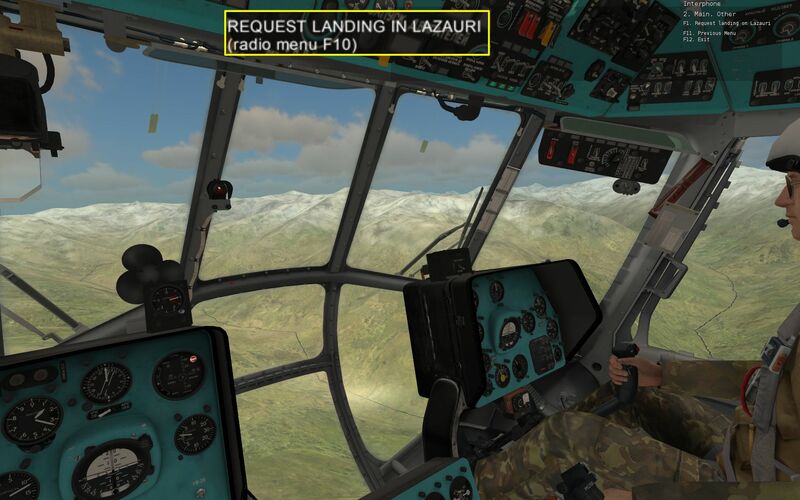 More designers need to use the F10 radio item for user interaction. Who says no to helping a guy get some vacation time? Once the equipment and extra crew are loaded on board, the cheif (sic) tells me I’m ready to go and the navigator/co-pilot reads out the next leg. 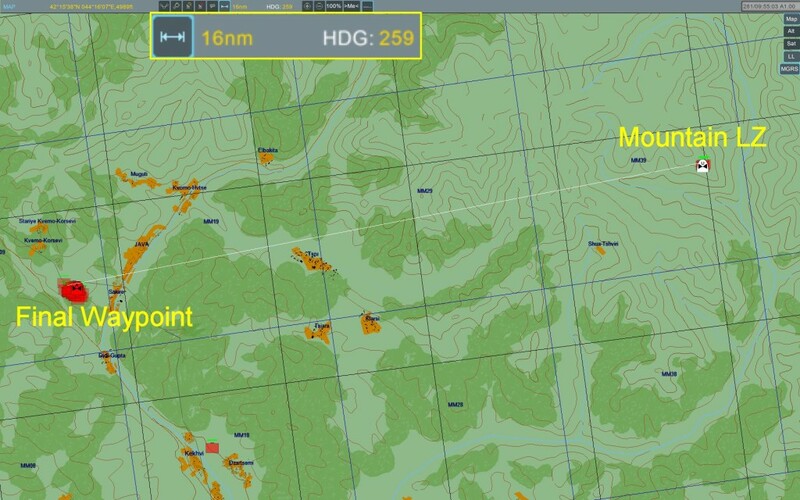 Not impressed with his previous performance, I pull up the F10 map once again to do my own plotting. Oh, co-pilot. You so silly. My copilot fails another chart-reading exercise. Inputs set and integrator integrating. 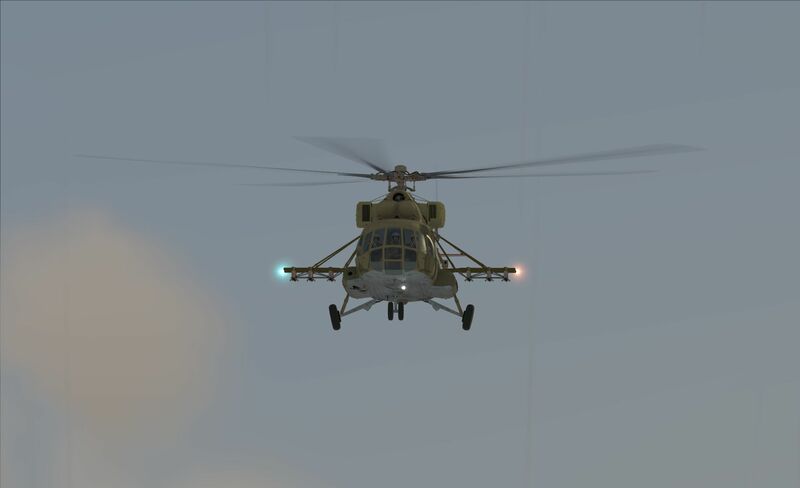 The heavy helicopter heaved itself huffily into the air, sluggish but still with out-of-ground effect hover margin. I’m not sure that margin will exist at a thousand meters higher altitude, and I’m really starting to sweat that mountain landing. I take off to the south and circle around back to the intended course, weaving around the hills as I climb up to altitude at 150 km/hr and about 3-5 m/s climb rate, keeping an eye on my destination, buried somewhere in the snow-covered mountains in the distance. Stay on top of cross track or you could literally end up going in circles. Keeping an eye on the goal. 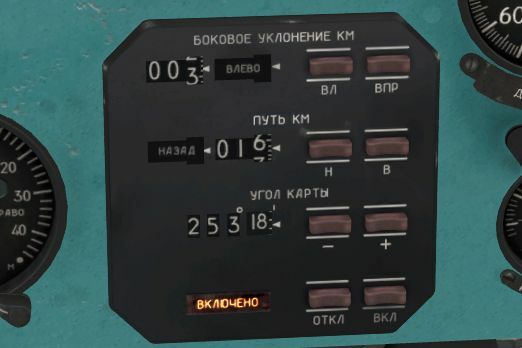 By intermittently checking in on the ДИСС-15 display, I’m able to quickly correct out my initial cross track error and maintain a course directly towards the next waypoint. 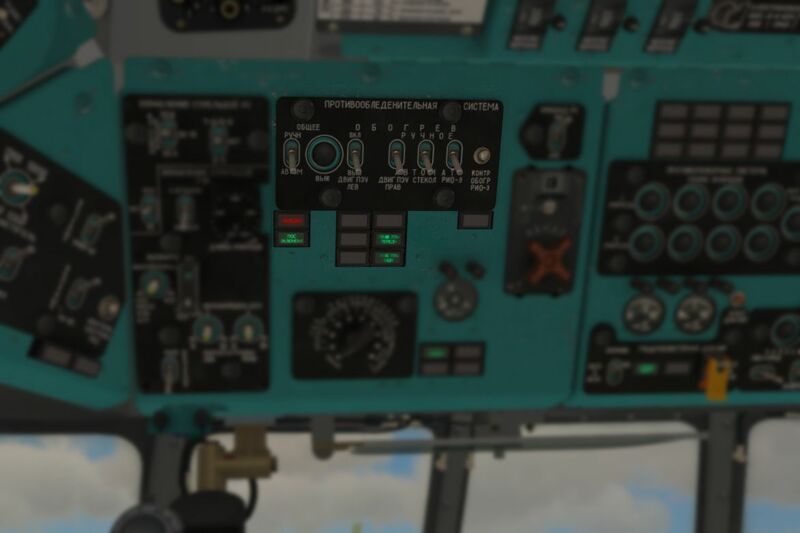 The drift indicator is reading almost 10 degrees of left drift while I’m in coordinated flight, indicating a pretty strong crosswind (next time I need to pay more attention to that weather briefing!). I’m not sure there’s ever a good time for a cockpit warning. 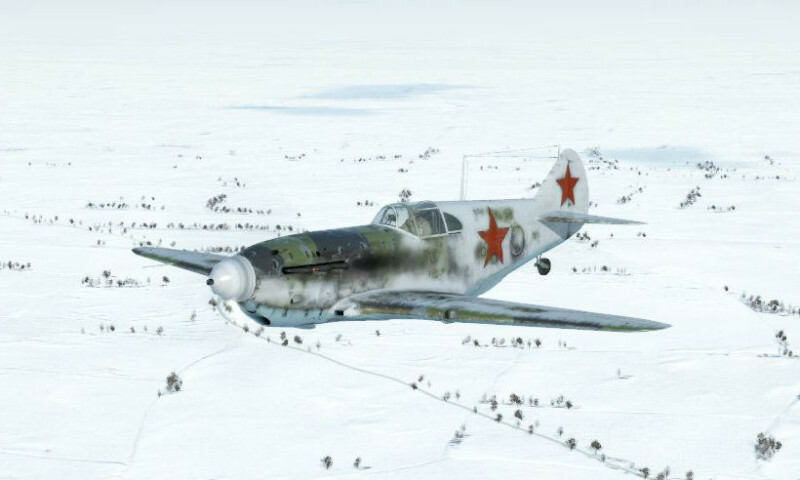 Midway through the climb, the flasher alert goes off in the cockpit and a quick scan picks up a blinking red light on the anti-icing control panel. I’m pretty sure the switches were all set to automatic, but I flip them to manual/ON just to be sure. I then check the anti-icing circuit ammeter to make sure I’m not going to have a much worse day. 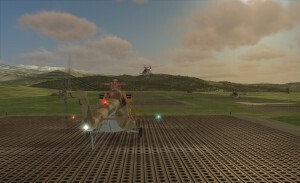 Ice and a heavy helo? Ugh. 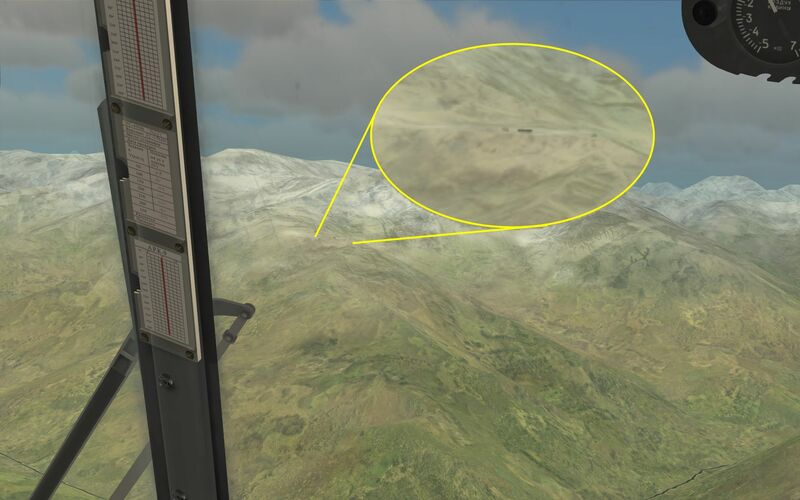 I continue my precarious climb up to the mountains and it’s not until I get pretty close (< 10 km) that I’m able to spot the mountain landing zone. When they said the landing zone was unprepared, they weren’t exaggerating! Almost there! Just a few more seconds! 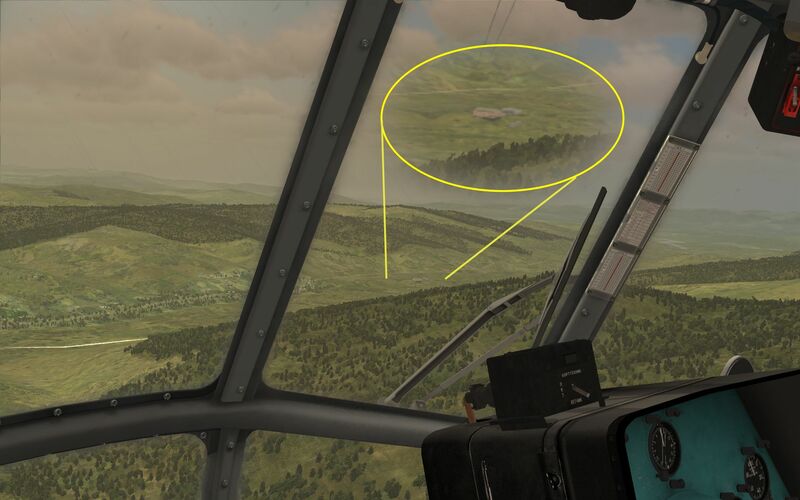 Spotted the unprepared landing site on the side of the mountain. 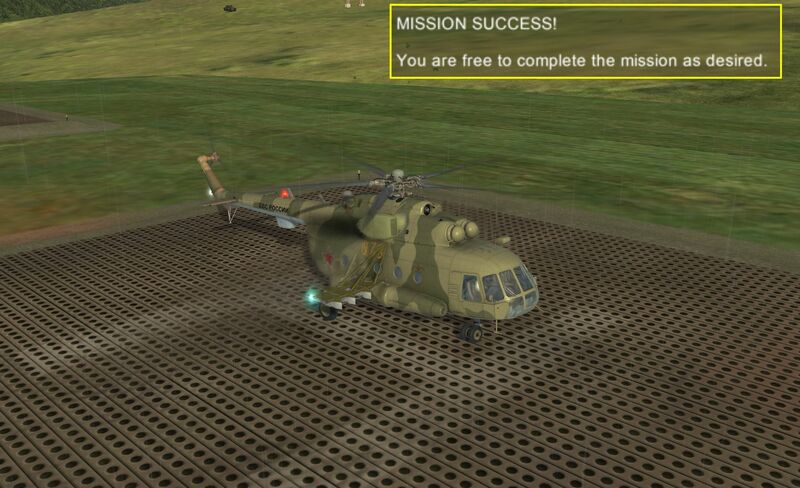 At some point I get close enough to the landing location that a message pops up on the screen, asking me to use the F10 menu to request a landing. 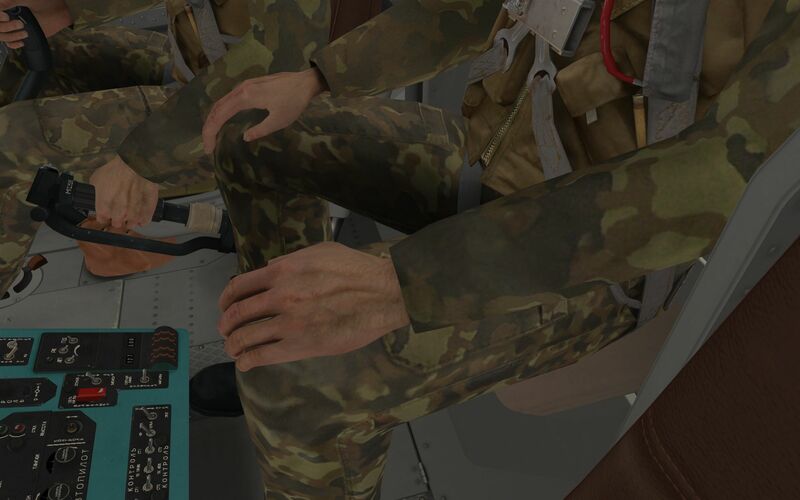 A common way to address this type of situation in other DCS missions I’ve flown is to have the mission trigger automatically start the dialog for the player, but I really like this interactive approach – much more immersive. 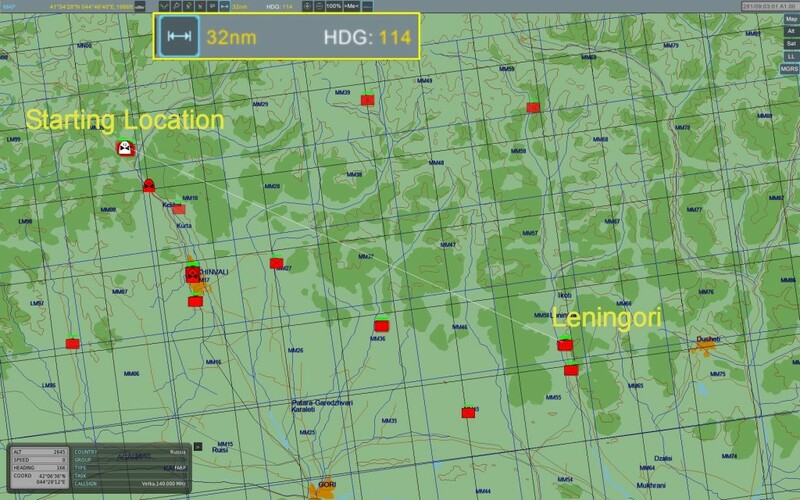 Another clever use of the F10 radio map to add immersion. The orange smoke is nice, but visibility isn’t the challenge with this landing location. Although this is an after action report/tutorial supplement, there is another point I’d like to make here – in addition to the text dialog interaction with the story characters, this mission has pretty decent voice acting as well. I won’t say great, because it’s not, but it’s pretty decent. In this particular dialog, the guy playing Lazur obviously recorded his lines at a different time/place than the guy who did Yuri, because they each pronounce “Lazur” completely differently. However, even as I notice that, I’m impressed they went through all that effort to collect the voice at all. Creating a stable script, coordinating the voice actors, trimming the audio, making the mission text match the spoken words, etc., is all incredibly complicated work for an effect that is too often taken for granted. This one moment of distraction made me realize just how good they got it for the rest of the mission. 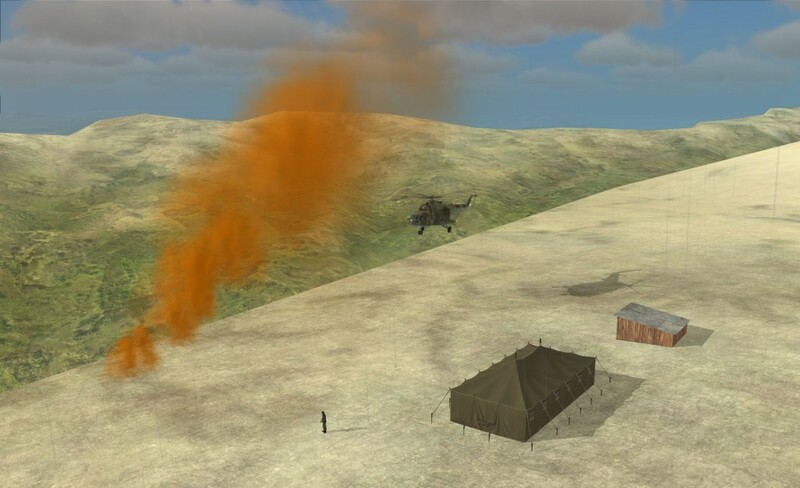 The orange smoke deployed at the landing site is beautiful – the streaming direction gives me an instant assessment of the wind direction and magnitude and I tweak my approach accordingly, making a soft vertical landing, although with practically zero power margin. No helicopter landing is easy, but an overloaded landing on an unprepared strip on the side of a mountain is deceptively tough. And, of course, there’s another curve ball. I don’t even get the choice to reject the plague victims from my helicopter, but now I’m really concerned about the overloaded condition this aircraft. If I was a true elitist, I’d have a weight and balance chart that I would update at every stop, but flying by the seat of the pants is way more fun. A hover check will give me a good sense for how close I am to reaching the aircraft’s limits. Before I do the hover check, however, it’s time to play another round of “Second Guess the Navigator”, so I pull up the F10 map and ruler to chart our route home. The last leg home should be short and sweet. Entering the last coordinates for the day. Leg 3: I’m Coming Home! … I Think! The ДИСС-15 is set, fuel is good, engine temps are good, oil is good, yadda yadda yadda is good, I lift the Hip straight up into a controlled hover at 10 m and I instantly know it’s not good. I’ve about maxed the collective and am barely able to maintain a 10m hover. This Hip is loaded to the max and the rotors just aren’t able to produce sufficient lift in this thin air. The good news is that the Hip has a rolling undercarriage and the takeoff location is at the top of a mountain, so I plan for an upwind rolling takeoff over the edge and into the valley below – a possibility I had considered before even setting down. 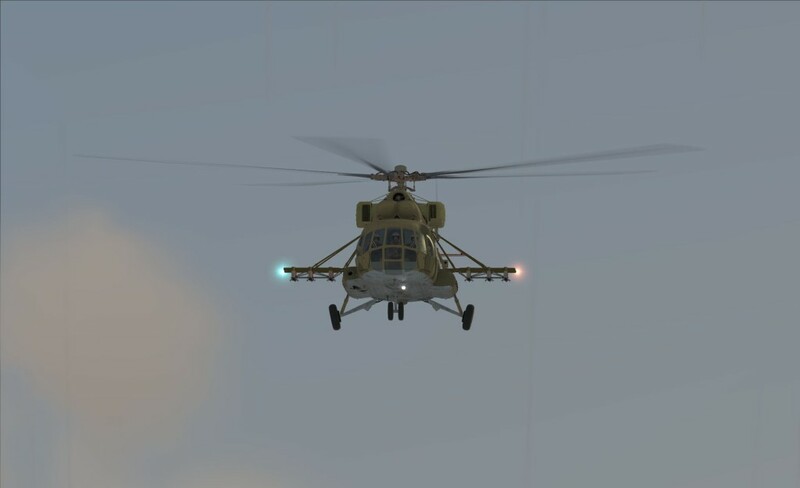 Once the rotor disk gets into some translational lift, even at this altitude, the Mi-8 should not only be able to maintain altitude, but make a decent climb to get over the neighboring ridge as well. 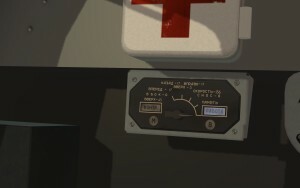 Hover power is not commonly checked in the sim world. “Exhilarating” is not really the right word to use to describe what I experienced with this particular takeoff, but I wasn’t able to find a good synonym for “oh my stars we made it I didn’t think we were going to make it we’re alive oh my stars”. As I expected (hoped? ), I was able to clear the surrounding ridge with some vertical speed to spare, although I had to jink a little to get around the higher parts of the ridge. This Hip is a beast! In addition to being overloaded, the icing warning is still blaring at me. I’m thankful that our final destination, Java, isn’t too far away and that I won’t need to walk too far from whichever crash site we end up using. There’s icing on the cake and then there’s icing on the rotor blades. Staying on track requires a little vigilance. It’s not long at all before I spot our home FARP and make another textbook approach and landing. 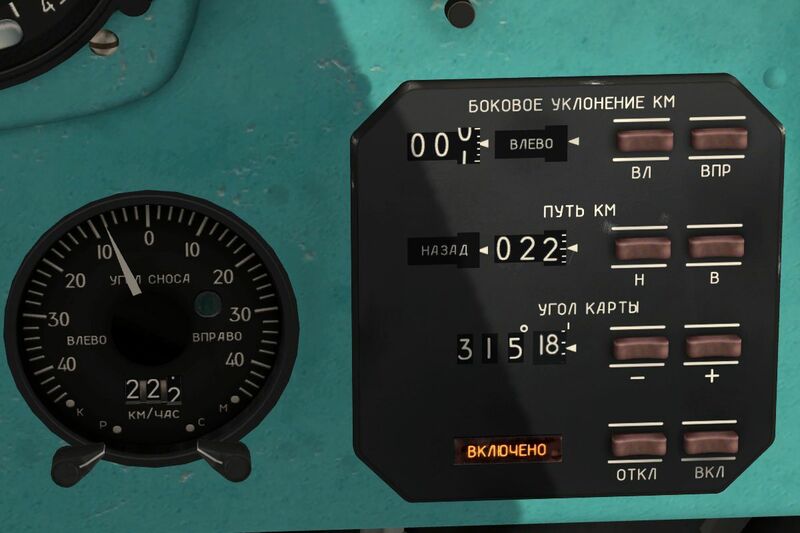 If you don’t stick your head out of the cockpit from time to time, the navigator will tell you precisely by how much you’ve overflown your destination. There are few feelings in this genre more satisfying than reaching for a shutdown checklist. Ah, the sweet smell of success! What do you mean I have to file a report? I didn’t show the residual errors (e.g., left over cross-track and along-track once I reached my destination) for each leg of this flight, but they were all within a kilometer. Here’s the error from the last leg. It doesn’t usually get much better than this. Given that the distance measurement given by the F10 map is plus/minus a half a nautical mile, a kilometer error is about as good as one can expect (0.5 Nmi * 1.852 km/Nmi = 926 meters!). 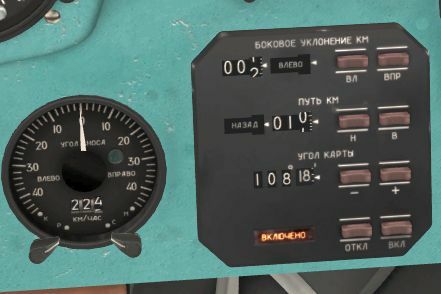 Granted, the legs of this hop were quite short and a decent pilot could fly this route using dead reckoning and pilotage alone, but this mission offers a perfect demonstration of the utility of the ДИСС-15 navigator. 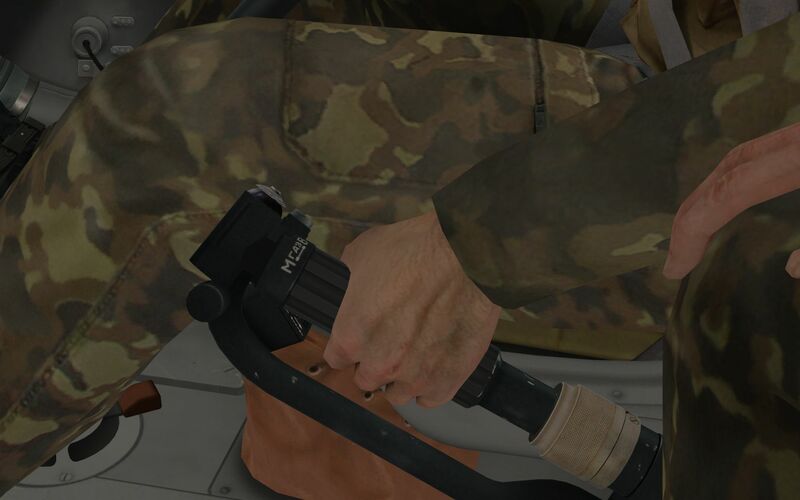 I hope you enjoyed this AAR and, for you folks following along with the ДИСС-15 tutorial, I hope you were able to learn a few things about this simple but powerful tool! I appreciated your observation on the weather conditions. You are absolutely correct that mission designers often miss out on this important consideration. 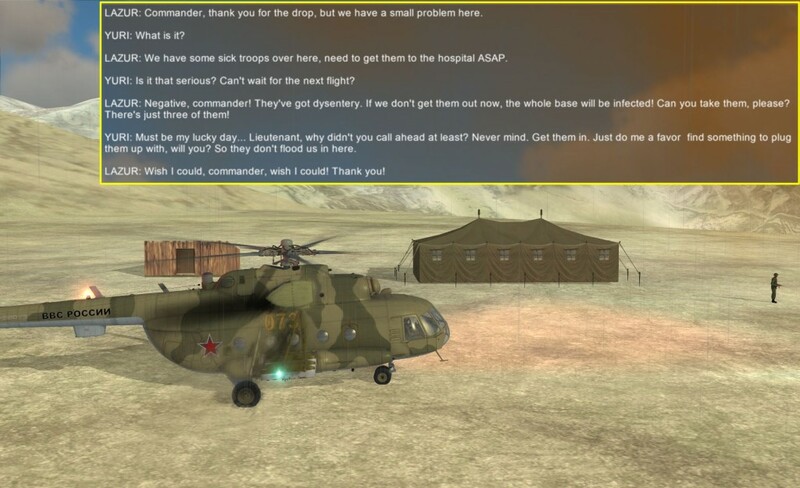 Regarding the AI helos coming in to land. 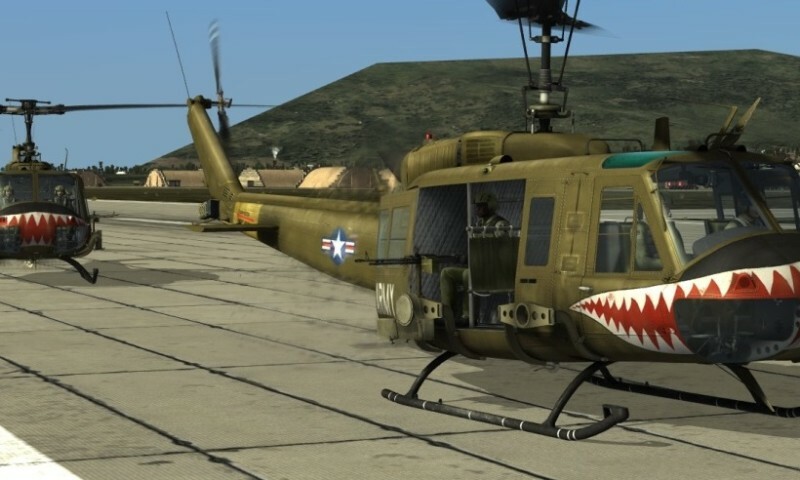 It sure would be nice if DCS had some sort of AI traffic template that just continuously added ambient AI traffic to airports and FARPS to give a sense of action – and the requirement to keep your head on a swivel. I’m sure it has been suggested before to ED – but they should look into making this an option you can select when designing missions. Good observations too on the voice acting and overall integration of the F10 menu. These are things that require time for mission designers to implement and are often overlooked. Kudos to the mission designer for taking the extra time to do it right. Really nice AAR – congrats on the inaugural site AAR! Nice one EinsteinEP. And with you joining as a editor, this website, newspage, has great potential. Very good AAR Einstein. 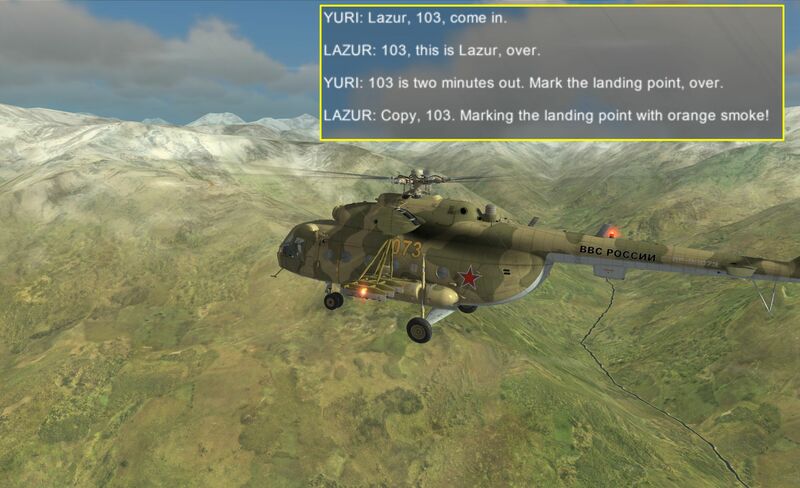 This and the Doppler tutorial made me get back into the Mi-8 this weekend after a nearly 5 months of not flying it. Very interesting indeed. Thanks. Did you try the ДИСС-15? How’d it go? Guys, you’re doing a great job here. 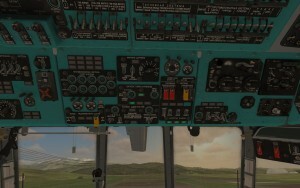 It made me go home and fly the Mi-8 and try to get familiar with Doppler navigation. I haven’t mastered it by any means but it is indeed relatively easy to grasp the basics once you know how to switch it on 🙂 but I think I have just scratched the surface as there seems to be lots more going on on the gauges than first appears. A most enjoyable AAR. The Hip is a great addition to this simulation. A good piece for someone just getting started on mission editing. Someone like me perhaps. I especially liked the points about making small changes that make quite a significant difference in the immersion factor. 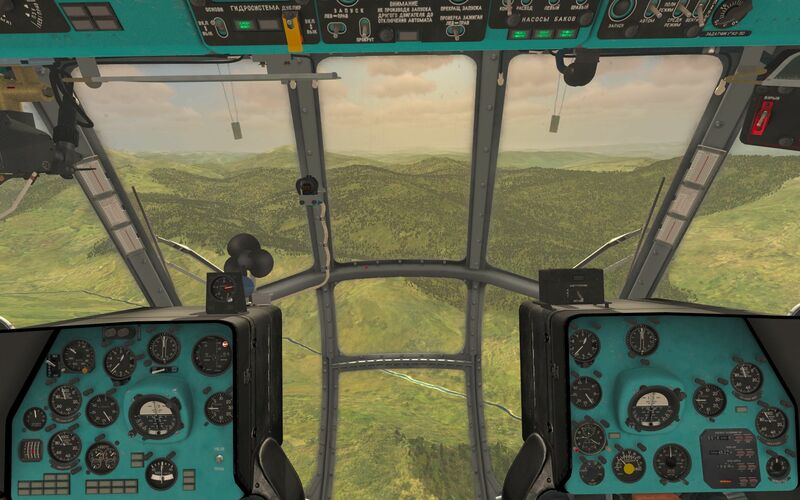 The thin air and overweight with a rolling start off the hillside was a good implementation, exploiting the limitations of this particular helicopter, and creating a dynamic experience.